IHG Rewards has begun to roll out its first promotion for 2018. Once again, it is a version of the Accelerate promotions it has been running for the past few years. The promotion kicks off January 1, and runs through to April 30. The Accelerate promotion is a gamified type of promotion. The promotion offers participants a range of tasks to complete. As each task is completed, a number of points are awarded, When all the tasks are completed, IHG pay a completion bonus. As different members will be presented with different offers, I will show the offers I have received. This will give a bit of the flavour of the types of offers being made. A fairly straightforward set of tasks, although I notice that there is no bonus for s stay in the first month. I do have a task for downloading and logging into the IHG app. This is a bit strange, as I already use the app. As for the other tasks, it will basically require 3 nights in 2 stays, as long as 2 of those nights are at an Intercontinental Hotel. Compared to the current Accelerate offer, this one is a quite simple. Indeed, I have quite a good chance of completing the new set of offers. 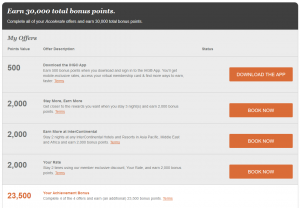 You can register and check out your offers on the IHG Rewards site. Previous articleQantas introduces the Qantas Premier Everyday Mastercard.